I hope everyone is staying warm and in good cheer. Tonight is known in these parts as Christmas Eve, and I already had a fun afternoon with family, as I went to the theater to see my nephew act in a Christmas play. I’m not a big fan of Winter, so I can’t claim this is my favorite time of year (it’s more like fourth on my list of seasonal preferences). However I do appreciate the symbolic start of a New Year, and certainly am willing to celebrate the end of the longest night of the year. I also think Jesus was probably the kind of guy that would have been fun to drink a few glasses of wine with, so I’m not averse to taking note of his birth while we’re at it. Whatever your reason for celebrating, if you are having a good time with family and friends you can’t be doing something too bad. Even if it causes you to step away from the anime for a bit, take the time to enjoy the folks around you. 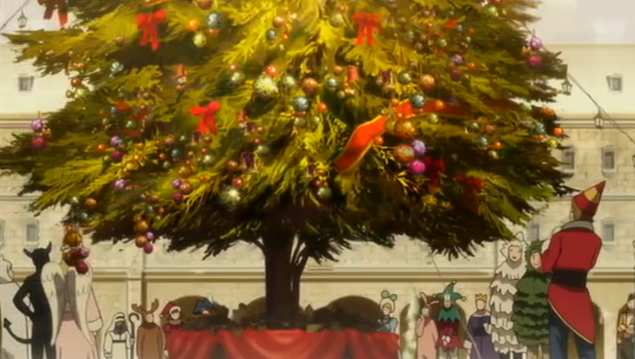 Merry Christmas, and a Happy, Healthy, and Prosperous New Year (full of great anime!!!). Thanks. A year full of great anime, now that does sound like a good time! Merry Christmas to you JooJoo! Hope you have a wonderful time this Christmas and a Happy New Year, too! Thanks, and the same in return. And a happy Kwanzaa to you too!